The Midwest Foodservice Expo is where buyers meet suppliers from every segment of foodservice. 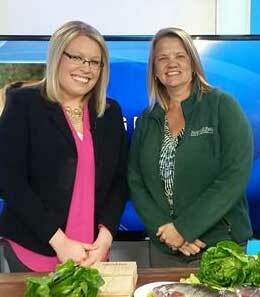 Rebecca Nelson, co-founder of Nelson and Pade, Inc.®, was featured on two Fox 6 Milwaukee news segments featuring aquaponics and our exhibit at the Expo. Montello, WI – Nelson and Pade, Inc.® was recently announced as the first Certified Naturally Grown (CNG) Aquaponics Producer. A global leader in the aquaponics industry, Nelson and Pade, Inc.® is proud to be the first aquaponic farm to achieve the CNG aquaponics certification and honored to be associated with CNG, a non-profit organization offering peer-review certification to farmers and beekeepers throughout the United States. and four Canadian provinces. CNG recently announced a new certification program for aquaponic producers. Nelson and Pade, Inc.® was the first to apply and the first to be certified in the new aquaponics program. The standards for Certified Naturally Grown are based on the highest ideals of the organic movement and their approach is based on transparency and direct relationships. We’re only about a week away from the 2016 North Central Aquaculture Conference at the Crowne Plaza Milwaukee Airport in Milwaukee. It’s March 12 and 13. Rebecca Nelson, co-owner of Nelson and Pade, Inc. and a North Central Regional Aquaculture Center representative, stopped by NewsChannel 7 at Noon on Thursday to talk about it. The theme is ‘Ideas for a Sustainable Aquaculture Industry.’ Fish farmers and others interested in aquaculture can learn about the latest on-farm innovations and advancements.